Traditionally, most trousers had pleats rather than being flat fronted. Usually two on either side, and usually outward-facing (meaning that the hollow of the fold was on the side of the hips rather than the fly). The pleat closest to the fly was deeper. The English often wore their pleats inward-facing, considering the way they fell to be more elegant as less likely to gape. But this was because they wore their trousers on the natural waist. This is easy to find: it is above your hip bones; often around the level of the belly button, though this can vary from one person to another. The waist is normally the slimmest point on a person, which is one reason men wore their trousers there, and why jackets are nipped in there – to accentuate the difference in width from shoulder to waist. It is certainly why women wore their skirts on the waist, and why many women still do so today. Their jackets are usually nipped in more obviously as well. Now if your trousers have a high rise (the length from crotch to waistband) and are sitting on your waist, they need to go out before they go in. They need to expand from this slim point to get up and over the hip bones. Otherwise they would be skintight from the waist all the way down to the middle of the thighs. Pleats are necessary. They enable this expansion neatly and elegantly, dovetailing back into the line of the trousers when width is no longer needed after the mid-thigh point. But you do not need them if you wear your trousers on your hips (as most do these days). This is also easy to determine – your trousers sit on the hip bone. The skin has hard hip bone underneath, not squidgy stomach. Why some men have trouble telling where their waist is I’ll never know. Pleats worn on the hips make your thighs look like melons. They create needless volume. Combine pleats with a sharp narrowing to the ankle, and cuffs at the bottom of the trouser, and you have the abomination of so many American khakis. The pleats give volume at the top of the leg. The narrow ankle accentuates this proportion. And the cuffs make your leg two inches shorter. It is hard to see how, without wearing pedal-pushers, a pair of trousers could be less flattering. Except that Americans have done it – they finish off the ensemble with a large pair of white trainers. So the trousers puddle at the ankle as well, their line being entirely unsuited to falling elegantly onto ankle-supporting Nikes. Pleats, again only if worn on the waist, can be flattering for larger men. They mean that their trousers fall straight down rather than going in first, highlighting a belly. That is the limited, albeit useful role of pleats. Ignore anyone who says they just want roomier pockets. While valid points are raised, and while the flat front is more modern and is cleaner, it is certainly not befitting for most men, as contemporary opinion suggests. I think the fundamental error is your assumption that trousers are supposed to be worn on the hips. It is erroneous to assume that pants have an exceptional long rise if they sit on your waist. The natural waist is where trousers are supposed to be worn; to wear them lower, generally, throws off the proportions of dress. It’s the basic architecture of dressing. While flat fronts have their place in the sartorial cosmology, I think the disposition of pleated trousers to just people who are heavy or wear their pants high-waisted is flawed. Just as pleats are not for everyone, flat fronts are not either. Many men can wear either style, if worn correctly. I can see the point for either, and I do own both. I have a couple of issues with flat fronts that I don’t have with pleats. First, flat fronts, when sat in all day, are not nearly as comfortable. They do bind (keep in mind, I’m assuming the pants fit properly and aren’t overly baggy) and cause me to have to stand on occasion and let the pant legs fall. Second, it now being summer weather in Southern California (it’s 97 F today), I tend to bring out the cotton and more so the linen trousers. Both of these crease much more then their wool counterparts and tend to crease in an area that should not have attention brought to it. I guess my point is that both have their place, but to say one is superior to the other is taking a too “black and white” position in a world that is increasingly gray. With regards to your comment on American khaki’s, I couldn’t agree more. I don’t believe it is the pleats per se, but more the fact that the pants are always cut too big. And, I don’t find this limited to trousers. I used to fluctuate between medium and large in most articles of clothing and now fluctuate between medium and small with no change in weight or general physique. I’m beginning to believe that clothing manufacturers believe we are all in excess of 250 lbs. Well, I must say, we are not…..only about 90% of us. The picture of the pleated trousers belonged to an online advertisement this week of a popular men’s clother in my area. I had intended today to visit the store and perhaps try on a pair, but after reading this article promptly made other plans. Who wants to be the man wearing the very pants vilified by one of the most popular web sites viewed by sartorialists? Ok – So I just got a custom three piece, but there was a mix up. I had asked for a single pleat, thinking it a bit more traditional, but I also ended up with a cuff, despite the fact that I hadn’t asked for it. Cuffs make me think of my father and the American khaki’s mentioned above. Is there a hard and fast rule about cuffs with pleats? I’m thinking of removing the cuff, but i definitely dig the pleat. For the most part they are unflattering and clunky looking. 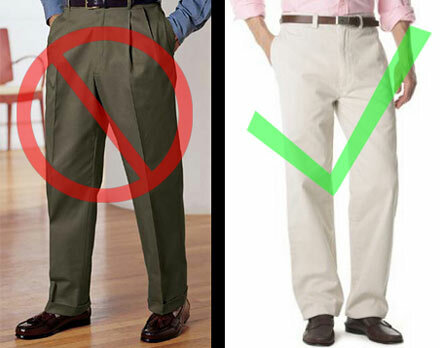 While it may been fine for SOME men to incorporate pleats into their suit trousers, please stay far away from pleated khakis. Just say no. Just think…would you wear pleated jeans? Perhaps its because of where I am buying my pants, but it seems like every pair of flat-front pants I have purchased leaves too much room in the seat. I am thin and basically have very little in the seat area to begin with so I need a fairly snug pair of pants. The flat-front pants just never seem to sufficiently snug so I always go with pleated. The point on the khakis vis-a-vis jeans is semi-valid, the core assumption is that wearers of khakis generally wear them casually. In most cases, I hazard to say this is untrue; for most men, unfortunately, the pleated khaki is their dress-up pant. At any rate, it’s dangerous to make blanket statements about a functional item of tailoring. And just like any tailoring concept, pleats are highly figure and individual intensive. As to the question of a cuff – cuffs can be quite cool, so don’t write it off immediately. Generally, on a pleated trouser, you wear a cuff. This also has the functional effect of weighting the bottom of the trouser, helping to ensure a clean drape and closure of the pleated front. Kudos on the single pleat, though – I find it’s a good split of the difference. Hi guys, interesting to hear your views. I appreciate that this can be a personal taste issue and this is only my opinion. However, Trey I think you have the most interesting point. I do not think that trousers are supposed to be worn on the hips. And I did not mean to imply that wearing them on the waist gives them a very long rise. But it is true that they were designed originally to help with the fact that trousers were worn on the waist. If you were them there, great, and pleats are definitely better. If you wear your trousers on the hips then it may be a personal issue what you do but it is certainly true that pleats are no longer performing the function they were designed for. I hope that clarifies my point. And MMS, Trey is right, cuffs are fine. Less dressy and a little less formal, but fine. For me, it’s largely a personal issue. But they do make you look shorter, which is worth bearing in mind. I’m not sure I’ve ever seen that many single pleat trousers in the UK, but it’s intriguing. I will look out for them. Unfortunately, I have been cursed with “solid” thighs and a slightly “swollen” backside. Thus, I find that I can’t get away with flat front trousers. I am limited to cuffs and pleats and trousers on the waist (which on this side of the pond I find puts me in the minority). Everyone here has a valid point. But nobody has mentioned how much the material plays as a factor. Although pleats may seem frumpier looking, it doesn’t when the material is more free-flowing. Physique isn’t that important; like in Brad’s situation, the endomorphs can use the pleated pants to create some shape. So it’s not just for the. Cuffs also play a purpose – it’s supposed to add weight to the trousers, not to collect link and lose change. It’s also a good way to fix the proportions of those of us who have long legs/high waists. The issue of pleats and of the rise of a well made pair of trousers is a matter of what is right as much as it is of where you come from or what the style is. A good tailor will create a bespoke suit that fits your body, Geof Souster, of Souster & Hicks, is about as good as they get and, fashion be damned, you can tell the second you put on one of his bespoke (“custom”, I believe, is the word used by Americans) suits that you are wearing something special. As a young man of 19, heading off to my first job in the city, he created for me several suits that were stylish, modern and yet unmistakably a Gentleman’s suit. Just, for god’s sake don’t ruin the look with a pair of loafers or a button down shirt. A good suit demands good shoes, a great shirt and a good tie. I disagree with your history of the pleat. Flat front is the normal and original style of trouser. It was what Brummel wore, and was the most common style of trouser for over one hundred years. A few fops in the early 19th C. wore pleats, but they were definitely the minority. In the Victorian age flat front still reined supreme, and it stayed that way really until the Oxford bags in the 1920s made baggy trousers popular. Pleats were added to give greater volume, not comfort. Any half-decent tailor can make comfortable flat-fronted trousers that sit on the natural waist. Pleats are supposed to lie flat, not flair out. The way to make your pleats lie flat is to have the front of your pants on the same level as the back. When I gain weight and put on a bit of a gut, my pants don’t want to stay up in front, they want to slip down below my gut. One way to address this is by wearing suspenders; otherwise, I spend the day adjusting my pants and tucking in my shirt. These pants should be worn at the waist. Not all flat front pants are the same. I recently bought a Hugo Boss tuxedo with a flat front and a low rise. Those pants sit at my hips sort of like a pair of jeans. It looks great.